Those of you who read my other blog will have noticed a total lack of new posts recently. This is only partly because of the four week break in Grands Prix. It is mostly because all my spare time is taken up with getting ready for another Austral Sinfonietta concert in September. 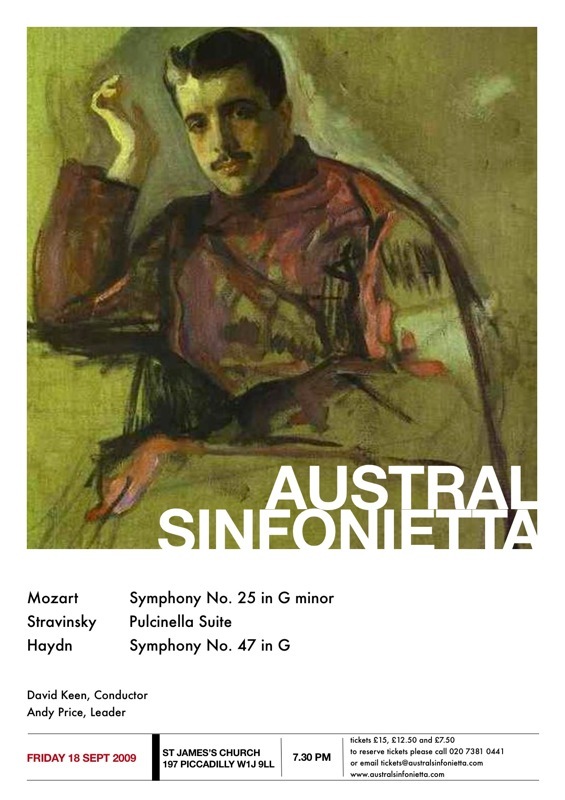 We will be playing Stravinsky’s Pulcinella Suite as well as symphonies by Haydn and Mozart — I’ve just realised that every Austral concert has had at least one piece by Mozart in it. Studying the scores has brought back memories of Alan. Back in 2001, he encouraged me to stage my own concerts in London and gave me the many kicks up the backside needed to see that I actually did it. God, those first couple of concerts were stressful! It makes me sad that he is going to miss this one and I wish I could talk to him about the music or ask his advice on things but I will be using his old stick and as most of the band are CCO, I suppose he will be there in spirit if not body. Anyway, if you are free on Friday the 18th of September and can make it to St James’s Church on Piccadilly for 7.30 pm, I’d love to see you there. It’s not a long programme so there will be plenty of time for a few in Walkers after the concert! wish we could all be there. i’m sure you will do extremely well. it’s sad to be so far apart for these occasions.